This entry is filed under Uncategorized and tagged art. here’s this awesome picture from one of my favorite artists, Dan Witz. He did a series on the new luxury condos coming up in Brooklyn. I agree with him, but at the same time, I am one of those yuppies who hopes to buy one, thinking then I can retain some vestige of my cool, counter-culture past by living in the cool neighborhood at the “right” time. Although some would argue Williamsburg is well past it’s prime, I say any neighborhood’s still cool until the moment Gap moves in. This entry is filed under Uncategorized and tagged art, fashion. D&G do Chamberlain, originally uploaded by pinkyracer. Finally! 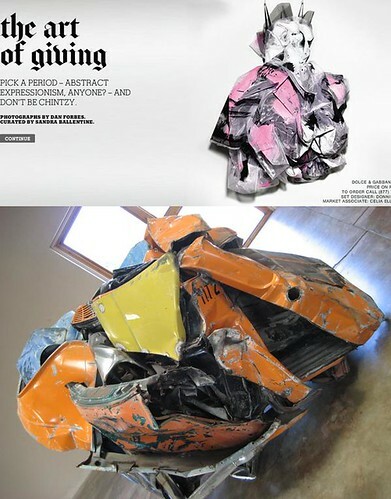 A John Chamberlain sculpture I can wear! Leave LA June 12th, Stop in Vegas to watch Ka, hang out in lavish American excess for a couple days. Pass through Phoenix quickly, making a mad dash for the artist’s colony/resort in Marfa, TX. Former location of the world’s most isolated Prada store. Spend a couple days soakin’ up some culture! Stop in that oasis of coolness, where the town slogan is: “Keep Austin weird!” (Thanks XTC for the reminder!